An efficient and compact piston type hydraulic motor is designed to be fitted to the thruster strut as part of the thruster hub. This motor has variable horsepower (constant torque) characteristics. The hydraulic motor has optimum running clearances and hydraulic balance to assure sustained high efficiency over the life of the motor. The inertia of rotating parts is low... parts are symmetrical, providing dynamic balance and free of vibration. The hydraulic thruster and propulsion systems are diverse and include a number of unique, high precision systems, ranging from the standard "Work Horse" fixed position hydraulic thrusters to the full Azimuthing/Rotatable Thruster Systems for all subsea dynamic positioning requirements. 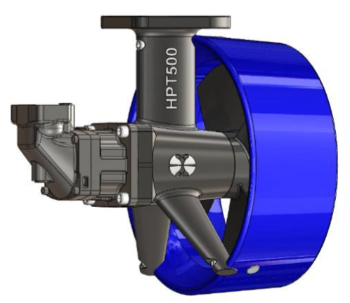 The HPT is a "unique" series of SubSea Hydraulic Thruster Systems, designed to be integrated with an highly efficient piston type hydraulic motor and incorporated to fit to the mounting strut as an integral part of the thruster hub with the Nozzle constructed in fiber composite , high density material. 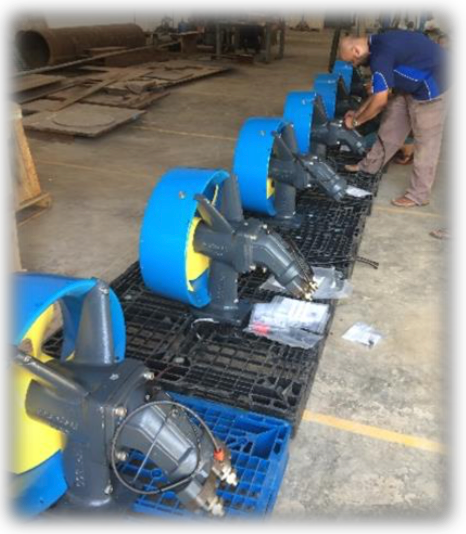 They come complete with Nozzle, mounting bracket and are offered from 12 to 110 horsepower. The hydraulic motor integrates/mounts to the thruster pod and baring assembly, therefore extremely lightweight and compact. The design speed of the propeller averages 28 meters/sec or less, offering efficient and silent operation. Depending on the Model Series, either a 4 or 5 bladed propellers are used. The thruster systems are pressure compensated and operational to all ocean depths. All thruster pod assemblies are manufactured from a high density ...fiber composite with all attaching hardware either 316 stainless steel or aluminum (hard anodized). Thrust figures are "measured" with a type 19A Nozzle Profile at zero speed of advance.